Last year, Zak Taylor got just a taste. He liked it. He cherished it. This year, he wanted more. He wanted it all. And he got it — along with his Oregon State University teammates. 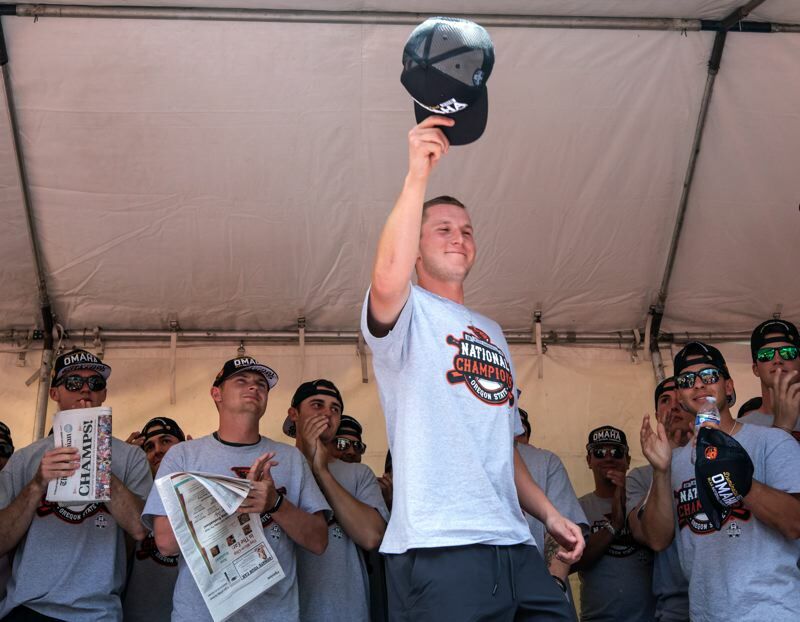 Taylor, a 2015 Sherwood High School graduate, and starting first baseman for the OSU baseball squad, helped the Beavers claim the championship at the 2018 NCAA College Baseball World Series, held back in late June in Omaha, Neb. "It didn't at first, but it's sunk in now," Taylor said earlier this week. "I wake up every morning, and it's the first thing I think about. At first, it was like 'did we really do that?'" They did — in impressive, never-say-die style. "This makes everything worth it," Taylor said. "All of the time we put in during the fall, getting up at 6 a.m. to hit the weights and then practice. It makes it all worth it, and I'm so happy." Last year, when the Beavers reached the 2017 College Baseball World Series, Taylor got into one game, a 13-1 win over Louisiana State University. While that was a special moment a year ago, it also paid off for him this year, in Oregon State's return to TD Ameritrade Park in Omaha. "It helped to get that experience last year," Taylor said. "This year, I was ready to go. I was like 'let's go win a national championship.'" The Oregon State squad went 2-2 during its stay at the 2017 College Baseball World Series. 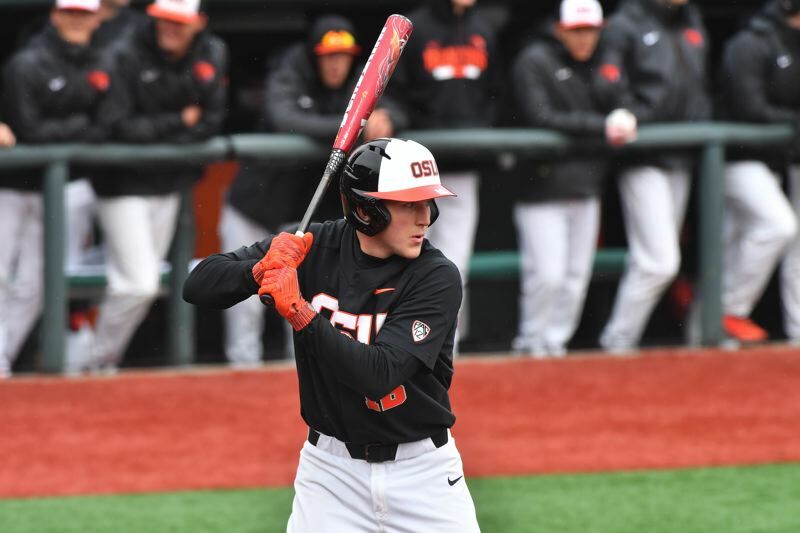 For this year's returning Beaver players, including Taylor and catcher Adley Rutschman, a 2016 Sherwood High School graduate, that less-than-desired performance provided motivation for the 2018 season — or, as Taylor put it, the team had "unfinished business." "Last year left a sour taste in our mouths," Taylor said. "So, this year, every time we broke as a team, we said 'finish.' Our end goal was to finish on top. We felt like we didn't have a weakness and that we had great team chemistry. We never felt like we couldn't do this." 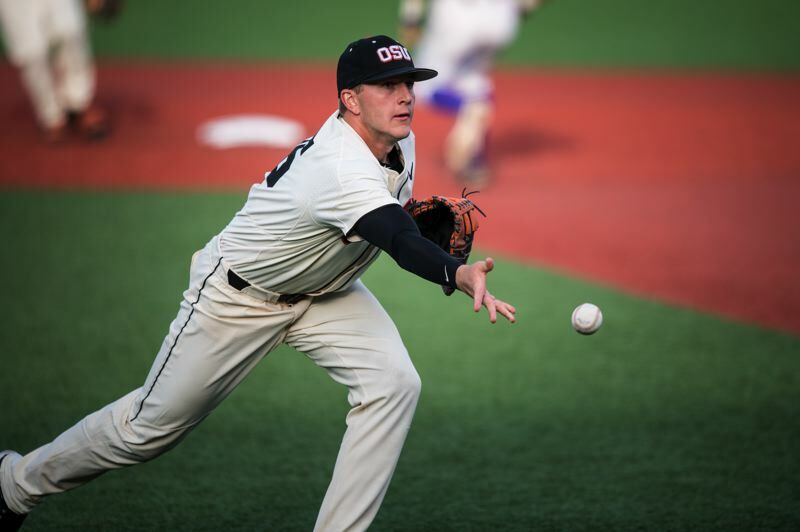 Oregon State went 44-10-1 during regular-season play, giving the Beavers a berth in the NCAA regionals, where they would serve as the host team, with games played at Goss Stadium in Corvallis. Oregon State opened regionals with a 9-3 win over Northwestern State, with Taylor hitting a home run and scoring a pair of runs in the victory. The Beavers then won two straight games against Louisiana State University, by scores of 14-1 (with Taylor going 3 for 4 with a double, a run scored and three RBIs) and 12-0, to advance in the NCAA playoffs. The Beavers then hosted Minnesota in the best-of-three Super Regionals, with a berth in the World Series at state. But Oregon State didn't need all three games. The Beavers won the first game of the Super Regionals 8-1. Taylor had a hit, drove in a run and scored a run in the victory. Rutschman hit a home run. Oregon State then wrapped up the series win with a 6-3 victory over the Gophers, sending the Beavers to Omaha for the second straight year. The Beavers didn't get off to the start they wanted at the World Series, as they were edged 8-6 by North Carolina in a first-round game of their half of the double-elimination bracket, held on June 16. But, despite that loss, and now with a tougher hill to climb in order to reach its ultimate goal, the Oregon State squad was far from discouraged. "There was never a panic," Taylor said. "We knew we were in the hard part of the bracket, and we just had to go out and refocus." That's just what the Beavers did. They bounced back from the loss to get a 14-5 win over Pac-12 foe Washington in a loser-out game on June 18. Oregon State followed that up with an 11-6 victory in a rematch with North Carolina on June 20. In that contest, where Rutschman went 3 for 5 at the plate with a home run, two runs scored and four RBIs, the Beavers scored four runs in both the eighth and ninth innings to rally from a 6-3 deficit to get the victory. With that win, Oregon State moved on to face Mississippi State in the finals of their half of the bracket. The Beavers would have to defeat Mississippi State twice to move onto the championship series. Oregon State won the first game against the Bulldogs, 12-2, in a game played June 22. Taylor tripled, scored twice and drove in two runs in that victory. The next day, the Beavers downed Mississippi State 5-2 to advance to the best-of-three championship series against Arkansas. In the championship series with Arkansas, where Oregon State was looking to win its first national title since winning back-to-back crowns in 2006 and 2007, the Beavers again faced an uphill battle, as they dropped the first game to the Razorbacks, 4-1, in a game played June 26. "We wanted that first game," said Taylor, who went 1 for 3 at the plate in that contest. "But we were mainly relieved that we got out of the elimination bracket. And their guy (Arkansas pitcher Blaine Knight) threw a great game." But once again, being one loss away from seeing their championship aspirations come up one step short, the Beavers showed no doubt. "We've come this far and made it all the way back," Taylor said. "I knew we could do it again." They could, but it wasn't easy. In the second game of the championship series, played June 27, Arkansas scored a run in the bottom of the second to take a 1-0 lead. Oregon State tied it up, at 1-1, on a solo home run by Rutschman in the top of the fourth inning. The Beavers stuck again in the top of the fifth, when Taylor singled and eventually scored on a bunt single by Cadyn Grenier, giving Oregon State a 2-1 lead. But Arkansas came roaring back, scoring twice in the bottom of the fifth inning to grab a 3-2 advantage. The Razorbacks carried that one-run lead all the way to the ninth inning, where the Beavers were down to their final at-bats. In the top of the ninth inning, with its season on the line, Oregon State knew it would be crucial to get its leadoff batter on base. And Taylor stepped up to the plate — with a look of determination on his face. "As a team, the biggest thing we preach is getting the leadoff batter on base," Taylor said. "I went up there confident. I had to get on base one way or another." Taylor was set to battle Arkansas relief pitcher Matt Cronin. Taylor, turning a pair of Cronin pitches, hit two long, deep foul balls into the left-field grandstands at TD Ameritrade Park. "After those two foul balls, I was confident," Taylor said. "I knew I was either going to get a hit or get a walk." The former Sherwood standout ended up winning the battle with Cronin, finishing a long at-bat by drawing a leadoff walk on a 3-2 pitch. "That felt great," Taylor said. "I got to first base, turned to the dugout and yelled 'let's go.'" But the Beavers still had plenty of work to do. Zach Clayton came in to pinch run for Taylor, and he moved up to second base on a sacrifice bunt by Andy Armstrong. Clayton then moved to third on a groundout by Nick Madrigal. But the Beavers were down to their final out. The next OSU batter, Grenier, hit an arcing foul ball to the right side. Arkansas faithful started celebrating a national championship. But, then, something unexpected happened — the ball dropped harmlessly in foul territory between three converging Arkansas players. "Arkansas fans got so quiet, and our dugout just exploded," Taylor said of the play. "That gave us new life. Baseball is funny like that, so many things can happen. Once that ball dropped, we knew Cadyn would get a hit." He did, smacking a single to left-center field, driving in Clayton with the game-tying run. Trevor Larnach followed that with a two-run home run, giving the Beavers a 5-3 lead going into the bottom of the ninth inning. Arkansas then went down in order in the bottom of the ninth, with the Beavers turnings a game-ending double play, sending the series to a winner-take-all third game. Oregon State seemed to have all the momentum in the world on its side going into that contest, but the Beavers weren't taking anything for granted. "We were still thinking 'finish,'" Taylor said. "We had momentum, but we still had to refocus. We knew that this was the right time for us to take care of business. We wanted to beat them in every facet of the game." Freshman Kevin Abel, in the June 28 final, pitched complete-game gem, throwing nine shutout innings, giving up just two hits, while striking out 10 and walking two. "I couldn't be happier for the guy," Taylor said. "He's always had the ability and the composure." The Bowmen duo also did their part. Rutschman went 3 for 4 at the plate with a run scored and two RBI. Taylor went 2 for 3 with an RBI, helping the Beavers come away with a 5-0 win — and the national championship. "The biggest thing thing was that I wanted to soak everything in and enjoy every moment. That took the pressure off," Taylor said of his title-game performance. "I really wanted to play for the seniors, like my roommate, Kyle Nobach. We all played for each other." For Taylor, the championship celebration kind of started even before the June 28 game with Arkansas came to an end. "When there was one out in the ninth inning, I turned to Trevor (Larnach) in right field, and we both just started smiling," Taylor said. "I never felt anything like that before. It was an unbelievable experience." Two outs later, with Abel getting the game-ending strikeout, the Beavers got to celebrate for real. "I almost didn't know what to do," Taylor said with a laugh. "I just wanted to celebrate with my teammates." That, of course, meant a dogpile on the infield at TD Ameritrade Park. "I think I've never been more excited," Taylor said. And there were more celebrations to come, such as a ceremony held June 29 in front of throngs of fans at Portland's Pioneer Courthouse Square. "That was special, especially being from the area," Taylor said. "It was amazing seeing Pioneer Square filled with people. I remember the celebration following the championships in '06 and '07, and, now to be a part of it was just amazing." Later that day, the Beavers had another celebration down at Goss Stadium in Corvallis. "Goss was filled," Taylor said. "All of Beaver Nation was there, and there were a lot of smiles. It was so cool to see people so happy and excited." Taylor, who spent the summer playing for the Corvallis Knights of the West Coast League, didn't get to enjoy much anonymity following the world series, and he's OK with that. "One of the best parts was talking with all the people," he said. "They'd tell you where they were when they watched the game, and how proud they were. It's crazy to think how we impacted so many lives." And then there were all the autographs he signed. "It was an honor," Taylor said. "And it's something you never get tired of, especially with little kids. I remember being there once." There could be more celebrations ahead for Oregon State a year from now. "I think we're still going to be strong," Taylor said. "Our starting pitching is going to be real strong. We're going to have some younger guys in the field, but we'll be solid. It's going to be good." And, of course, the Beavers will also return Rutschman, who will be a junior, and Taylor, who will be a senior, next year. "A senior, that's crazy," Taylor said with a laugh. "But, these four years, I couldn't ask for more. My first two years here weren't exactly the best, but I'm ready to finish strong." It sounds like Zak Taylor is hungry again.